My goodness, what a mouthful! But that's what it is; a mini version of the Ear Flap Ski Hat, but this one is just for kids!! Again, this little beauty only needs 2 needles, no Circular needles and definately no dreaded DPNs!! I've put the size as 1-2 years old, but it's quite stretchy so it is a rough guide. The picture gives you an idea - my gorgeous little model is Tom; a big thanks to him and to his parents for allowing me to publish this picture of him showing off his new hat!! SIZE: Child 1-2 years Finished Circumference approx 18 inches. Aran/Chunky Wool. I prefer chunky (Bulky) because the hat comes out thicker and therefore warmer! 5mm Needles. Yup, that's it; just 1 pair of 5mm needles - can you believe it?!! !Chunky wool in whatever colour you would like. The pattern is written as if it's all one colour - just change wool wherever you would like to add stripes of colour. The design also works in Aran with no need to change size, though it makes a thinner hat. Cast on 3 sts. Work in k1, p1 rib until you have a 7 inch length for the tie. Continue as established, increasing 2 sts of each row until there are 23 sts; ending on a WS row.Slip stitches onto a spare needle or holder. Make a second Earflap the same, adding this to the spare needle/stitch holder. Cast on 5 sts then knit across 23 earflap sts. Then cast on another 16 sts, knit across 23 stitches of second earflap and then cast on another 5 sts – 72 sts.Work even in St st until piece measures 4.5 inches above joining row, end with a RS row. Row 1: *K5, k2tog; rep from * across row – 60 sts. Row 3: *K4, k2tog; rep from * across row – 50 sts. Row 5: *K3, k2tog; rep from * across row – 40 sts. Row 7: *K2, k2tog; rep from * across row – 30 sts. Row 9: *K1, k2tog; rep from * across row – 20 sts. Row 11: K2tog across – 10 sts. Row 13: K2tog across - 5 sts. 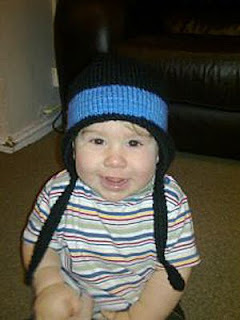 Hi I'm a beginner knitter and would like to make this hat for my son. Firstly, I'd like to give you a big thanks for this earflap pattern..I haven't found any other pattern using only straight needles! I have a question about the earflaps. Once I finish an earflap, do I slip it onto a spare needle and then cut the yarn leaving a tail? Do I do this for each ear flap? If yes, what do I then do with the tail? And when I'm joining together, do I slip the tail back on the 5mm needle? Not quite sure how to join everything. Correction: I meant do I slip the earflap (not tail) back onto the 5mm needle?